Invite bird tenants to your yard with the Heartwood Mahogany Wrental Home. Simple, straight lines offer a clean look to this home, with an A-line panel on the front of the home for added interest. Copper flashing along the top of the roof draws the eye, and lap siding on the front panel brings contrast to the piece. Ventilation slots under the roof help regulate the interior temperature, and two slots on the base of the home keep nests dry. The 1.25" diameter entrance hole allows wrens and other small songbirds to enter, and a removable copper panel on the back of the home enables seasonal nest checks. Use the included metal ring to mount this home to a wall or post for added height. The mahogany construction is perfect for use outdoors, and the brown color adds an organic feel. 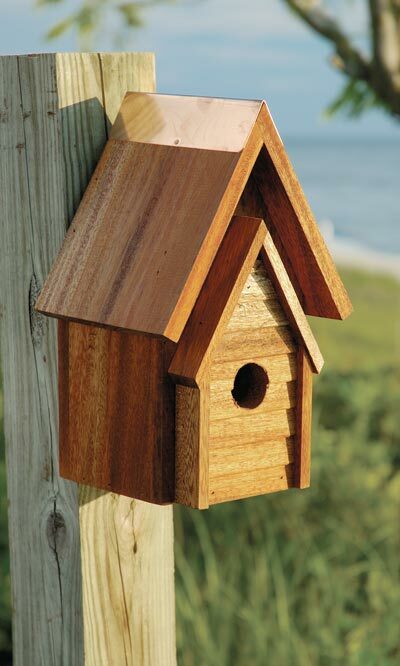 Offer a cozy apartment for your songbirds with this Mahogany Wrental Home. Made in the USA.